When a sky-diving accident left the fiancee of former NASA astronaut Steve Austin fighting for her life, he turned to his new boss Oscar Goldman to turn the twisted wreck of his wife-to-be back into a fully functioning human being. As head of the Office of Scientific Intelligence, Goldman had been responsible a couple of years earlier for Austin's own transformation into the Six Milllion Dollar Man - stronger and faster than he was before, thanks to the new science of bionics, a fusion of computers and the natural human body. Austin's damaged limbs were replicated and improved on, making him better than before. Now Austin asked for the same procedure to be carried out on the dying Jaime Soomers - replacing her smashed legs and arm, and her torn ear with the most up-to-date technology, making her The Bionic Woman. Initially reluctant, Goldman finally agreed, and Jaime was remade - but her body couldn't cope with the bionic implants, and she later died on the operating table. And that should have been that. As star of The Six Million Dollar Man, Lee Majors had suggested that he have a 'gilr back home' and it added a new dimension to his all-action hero to have him in love, fighting for her life, and then grieving as she finally died. A good two-part story to adde to the ratings. But something went wrong - or incredibly right. the American public fell for jaime Sommers, and the actress who played her, Lindsay Wagner, in a big way. 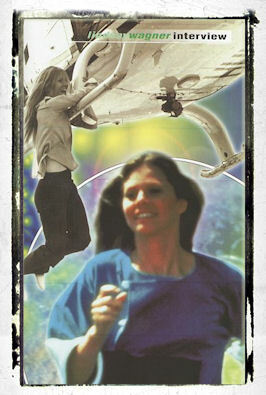 And so, eventually, after alot of problems along the way The Bionic Woman was born as a seperate, spin-off, series. Lindsay Wagner hasn't spoken often about those years, and how she feels about jaime, and the show. She has used her position in the industry to make a number of films about issues that are close to her heart - knowing her position in the hearts of the public would engender the ratings so dear to the hearts of the network executives who otherwise might have turned down the projects. However, contary to common perception, she is willing to discuss The Bionic Woman. A convoluted journey took Lindsay to the position of contract player for Universal Studios. She started acting wehn she was 12, and found it was an amazing emotional release for her. After some years, she decided to take up the craft professionally, and unfortunately did so in the middle of an actors' strike, although she was lucky and landed a part on one of the few shows that had brokered a deal to keep filming - medical drama Marcus Welby MD. That led almost instanty to being signed by Universal. "I did about 13 guest-starring roles in their television series" she recalls. "Then after I did the 13th show, Robert Wise was doing a movie caled Two People, the first film that was about the Vietnam War. Then as a result of that film, Jim bridges hired me to do The Paper Chase. When I came back from that, Universal wanted to put me back in the episodic thing. That's when I started to take hold a little bit of my career and refused to do that. I did a couple of episodes the next year-and- a-half. Eventually Universal said okay, fine, we can't see eye to eye, and they released me from my contract. "Just before I left they said 'If you do this one thing for us, this special one thing, we'll let you go' - and this one thing was Jaime! So I did it, and then I left. They let me go. Then they had to bring me back and made a very handsome deal to bring me back to life. But then of course I was gone again, because it was a one-shot thing. Then all of a suddent this Bionic Woman thing starts chasing me and I'm going 'Go away, go away, I don't want to do a series!'" The common perception is that the reason Lindsay refused initially to play Jaime on a weekly basis was financial, but the actress makes it clear that she had other considerations. 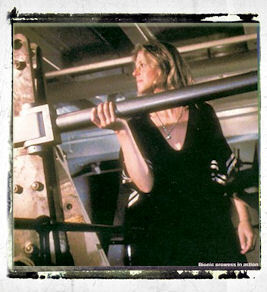 After finishing work on the Return of the Bionic Woman two-parter, she had begun to teach at the school connected to her church - fore-shadowing Jaime Sommers' post-tennis career in the eventual series. She felt torn between staying working with children, and pursuing acting. "I was asking what good is it going to do me to do this show where I'm jumping off buildings?" she recalls. "I watched Lee's show, and for me, the Sci-Fi part of it wasn't enough. A grilfriend of mine said, 'She's still a human being, you can do stories about human beings. You can help kids - talk to them through the series.' So all of a sudden I started looking at it in a different light. "I went back to the studio and had talks with them. I told them that I didn't want to do stories that were just espionage. I couldn't do it the way the other series had been done. If you notice, in my series it's very different - all these funny things we do with bionics: washing the dishes, tearing up phone books, carving names in trees. That's when it became something other than physical strength in one to one combat. I wanted them to write stories where Jaime used her heart and mind to surmount the problem, not just her physical strength. "That's why the series was so tumultuous because we were fighting all the time about the scripts. I pushed them, and they really had to think hard. It was hard for them, unquestionably, but they started disciplining themselves to do it right the first time, and that was easier to work with. It's easier to tweak something than to trying to restructure it." Although Lindsay enjoyed making the series, despite all the problems that came from the constant rewriting, she admits, "I would never want to do another one under those circumstances again. It was equally as painful as it was enjoyable. But it was also an extraordinary huge learning curve at that time. About the business in general, about me, about people, human nature, about the craft." She returned to playing Jaime for three tv movies - the clumsily titled Return of the Six Million Dollar Man and the Bionic Woman, Bionic Showdown (which also featured a bionic Sandra Bullock in her pre-Speed days), and 1994's Bionic Ever After? (also known as Bionic Breakdown). "Universal were willing to do them, but it was tough," she admits. "They basically just turned out to be just capers. It became less and less interesting to me, or have any appeal for me to want to be involved in it. Somehow they weren't able to get to do stories which to me were meaningful. I don't think the movies lived up to the series." The five year gap between the last two movies was partly caused by Lindsay's insistence that the relationship between Steve Austin and Jaime Sommers finally be regularized. "I said I won't do it again unless they get married," she says. "You've got to give that to the public; you can't just drag them around, the two of us in wheelchairs, with people still waiting for the two of us old fogies to get married. These folk have been with us, and loved us, and we've had this wonderful relationship with them, and they should have the satisfaction of that. "Plus, what's it saying about these two who can't get off their own situations and commit to each other? Or jump level and stop having this unrequited stuff...? It's a marketing game, and it was becoming painful for me. I felt bad and it was disrespectful to the audience but they were cool, and said, 'Okay we'll marry them' and then we could put it to bed." While Lindsay says that she never says 'never' to any project, she would be hard pressed to return to playing Jaime Sommers - despite rumours to the contrary with regard to the proposed Farrelly Brothers re-make, The Six Billion Dollar Man [see EMPIRE article, Sept. 2000]. Her career has taken her in a vastly different direction, playing ordinary people caught up in situations that the audience could understand. Recently, she has taken a two year sabbatical from film production, partly for a rest and partly to work on a new herbal product. Herbal Advantage, which goes on sale in America and via the internet later this year. "It's like a once-a-day herbal supplement, like you have once a day vitamins," she explains. "A lot of people are staring to learn and understand the benfits of herbs now. I wanted something that would make it easy for people to take herbs, get the benefit of a preventative measure, and something that would enhance their health so that they don't have these breakdowns and reach for them only to heal themselves. "I'm ready to go back to work now. My juices are flowing again in this area, so I'm going to start developing a couple of things of my own, and get ready to go back to work. Maybe they'll come up with something that excites me." Whatever it is, her place in tv history is assured. As she points out, "When I look back, The Bionic Woman was really the very first dramatic show that starred a woman in any kind of action one-hour show."